Highways « Global Market Insights, Inc.
FRP rebars find extensive applications in MRI rooms, bridges & buildings, marine structures & waterfronts, water treatment plants, and highways. 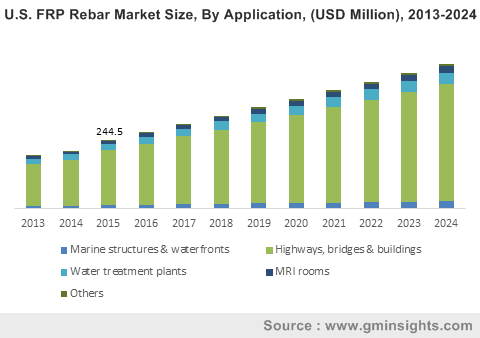 FRP rebars market size in the marine structures & waterfronts sector is predicted to grow at a cumulative rate of more than 7% over the coming timeline. An increase in the number of projects for constructing waterfronts and ports near seas and rivers along with the development of waterways as an effective mode of goods transport facility will contribute toward the business expansion. FRP rebars industry revenue across water treatment plants sector, which was estimated at more than USD 50 million in 2015, is expected to witness a high surge over the coming years. Rise in the number of desalination plant projects and surge in the waste & water treatment plant constructions will impel the segment growth. FRP rebars market share in MRI rooms sector is projected to record significant gains of more than 6.5% over the period from 2016 to 2024. Favorable features such as heat resistance, magnetic transparency, and electric resistance will boost the product demand. Considering the geographical landscape, North America FRP rebars industry is anticipated to record a CAGR of more than 7% over the coming seven years. Escalated spending on building new structures along with beneficial legislations supporting infrastructure growth will enlarge the business scope across the region. U.S. FRP rebars industry, which contributed USD 270 million toward North America FRP rebars industry revenue in 2015, is expected to make notable contributions toward the regional share in the future. The country had spent more than USD 1 trillion on construction ventures during 2015. Asia Pacific FRP rebars market is slated to grow at a rate of 8% over the years to come, owing to high product usage in the resistant edifice constructions along with the renovations of old structures. China, Japan, and India are likely to drive the regional revenue. MEA FRP rebars industry is projected to register an annual growth of 8.5% over 2016-2024, owing to strict regulatory compliances over the construction of new roads, railways, and airports as a result of growing safety concerns. Saudi Arabi and UAE are anticipated to be the major regional revenue pockets. Europe FRP rebars industry is projected to record a CAGR of more than 6.5% over the coming seven years. 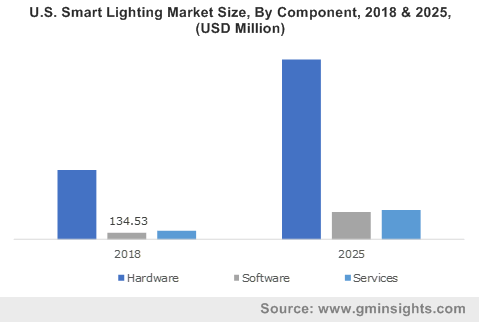 Growing renovation activities across the commercial and residential sectors along with high product applications in MRI rooms, cable ducts, radio frequency field, and high-voltage substations are expected to boost the industry size. UK and Germany are predicted to push the regional development. Glass fiber composites, carbon fiber composites, basalt fiber composites, and aramid fiber composites are the main FRP rebar products. Basalt fiber composites FRP rebars industry is expected to record a CAGR of 9% during the duration from 2016 to 2024, subject to exceptional product features such as magnetic transparency and rust resistance along with abundant product availability. Carbon fiber composites FRP rebars market is projected to grow at a rate of more than 8% over 2016-2024, driven by high product demand in floor slabs, bridge constructions, parapets, parking, ad decks & railings. Glass fiber composites FRP rebars market, which dominated the product landscape in 2015, is foreseen to witness notable gains over the years ahead. The growth can be ascribed to the product’s prolific use by the consumers as a perfect substitute for stainless steel & galvanized reinforcements. FRP rebars are also used in various kinds of resins such as vinyl ester and polyester resins. Vinyl ester FRP rebars market is forecast to grow at a CAGR of more than 9% over the period of 2016-2024, due to the outstanding corrosion resisting and thermal insulating features of the product. Polyester resin FRP rebars industry, which collected a revenue of USD 460 million in 2015, is projected to witness a considerable development over the coming years. The business expansion can be attributed to the elevated product use as an adhesive in tarnished heritage structures along with its unique dimensional features and cost-effective nature. Of late, industry players are employing key business growth strategies such as product development, pricing, and strategic partnerships to increase their market share. Fibrolux GmbH, Hughes Brothers Inc., Sireg Geotech Srl, Technobasalt Invest LLC, Marshall Composites Technologies, BP Composites Limited, Neuvokas Corporation, Pultrall Inc., and Composite Rebar Technologies Incorporation are the major participants of FRP rebars market. This entry was posted in Polymers and Advanced Materials and tagged Aramid Fiber Composites, Basalt Fiber Composites, Basalt fiber composites FRP rebar market, Bridges & Buildings, Carbon Fiber Composites, Carbon FRP rebar market, Fiber Reinforced Polymer (FRP) Rebars Market, Fiber Reinforced Polymer Rebars Market Analysis, Fiber Reinforced Polymer Rebars Market Forecast, Fiber Reinforced Polymer Rebars Market Growth, Fiber Reinforced Polymer Rebars Market Share, Fiber Reinforced Polymer Rebars Market Size, Fiber Reinforced Polymer Rebars Market Trends, Fiber Reinforced Polymer Rebars Market Update, FRP Rebars Market, FRP Rebars Market Analysis, FRP Rebars market pdf, FRP Rebars Market Report, Glass Fiber Composites, Glass fiber composites FRP rebar market, Highways, Marine Structures & Waterfronts, MRI Rooms, Polyester, Polyester resin FRP rebar market, Vinyl Ester, Vinyl ester resin FRP rebar market, Water Treatment Plants.